Add the iBT751 to your account to receive email notifications about software/firmware updates and more. I’m unable to pair the app to my mobile device. Make sure your mobile device’s Bluetooth is enabled (turned ON). Make sure it is not already connected to another Bluetooth device. (the iHome product can only be connected to one device). Disable the other device’s Bluetooth function to disconnect it from the iHome Product. If you cannot identify the paired device follow option #3. Some iHome models allow you to clear the Bluetooth settings, press and hold Bluetooth Button for 10 seconds until you hear a tone. Proceed to pair the app on the desired mobile device. I paired my mobile device with the Enhance app but I am not getting any audio. The Enhance app leverages Bluetooth Low Energy (BLE) to handle communication between the speaker and the app. Audio playback occurs via traditional Bluetooth (independent of BLE). Please ensure that you have both BLE (App) and traditional Bluetooth connectivity. Go to your Bluetooth settings on your mobile device to pair with the speaker. Windows 7/8/10: a. Right click on the speaker icon located on the bottom right of your screen b. Select playback devices c. Select the device you want to play and click OK.
Mac: a. Click on System preferences icon b. Click on Sound c. Select Output d. Select “iHome unit stereo” for the output source, and adjust the output volume if necessary. What is the wireless range for app functionality and audio streaming? The wireless range is approximately 33 feet for both functions. How do I turn OFF the alarm from the app? Launch the Enhance app, select “Alarms” and slide the switch to the off position. 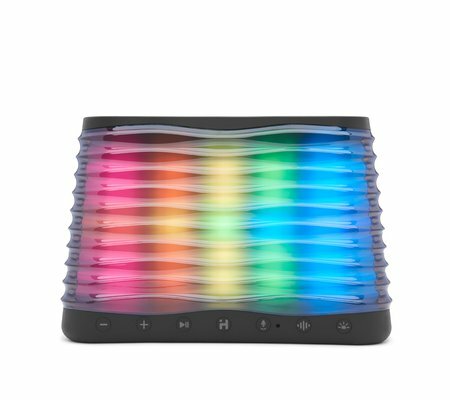 Can the Enhance app be used with other iHome color changing speakers? The Enhance app works with a number of products in the iHome Color Changing Series. Please refer to the product manual for compatibility details. Are settings made in the app saved on my iHome product? Yes, the majority of settings are saved on your iHome product. Mode, Volume, Lighting Modes, Alarms, etc. are all saved on the iHome unit and will be there even if the app is not present. Please note that any changes on the iHome product can change these settings (in other words, if you set an alarm using iHome Enhance and then change the alarm using buttons on the iHome product, the changes will override the settings made by the app). Do I need the app to control my product? It depends on the product (and function). Most of iHome products are complemented by the app – the app allows for remote/streamlined customization and works in conjunction with hardware. Please consult your IB or contact iHome Support if you have any specific questions. Does the Enhance app support Android products? Yes, it supports OS 4.4(Jelly Bean) or later. Does the Enhance app support iOS products? Does the Enhance app support Microsoft Windows OS? Currently, iHome Enhance App does not support Microsoft Windows OS. What is the function of the Action Button? The “Action Buttons” is a programmable button that can be set to control a group of actions with a single press. Why do I hear a tone when I press the “Action Buttons”? Hearing a tone indicates that the “Smart Button” has not been programmed. It’s this unit app compatible? Yes, this model is compatible with the free iHome “Enhance App” which can be download from the App Store or Google Play to enjoy wireless interaction with iBT751 and your Bluetooth device.